When most people think of hotels in Tokyo, the massive, many-storied giants come to mind, replete with subway stops below and floors of restaurants and banquet halls. However, since May 13th of this year, a very new concept has come to town, and it’s to be found in ultra-hip Ura-Harajuku. 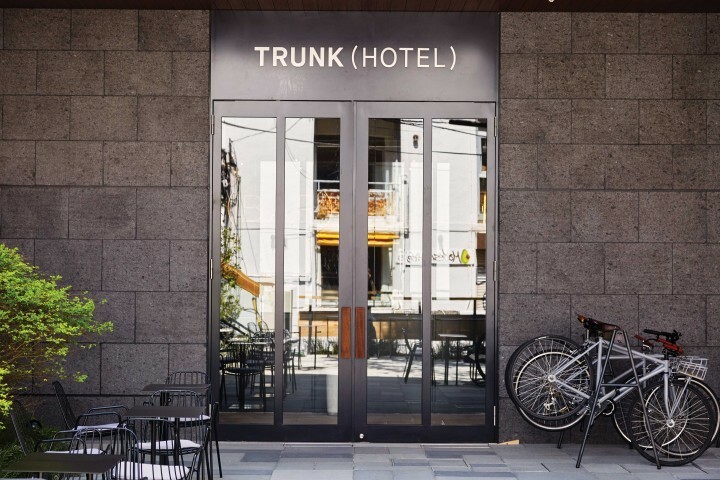 TRUNK (HOTEL) is crafted in the style of the boutique hotels that have found popularity in New York and other major cities, but with a unique Tokyo style all its own. The four-story structure houses only 15 guestrooms, but these somehow manage to be swank while at the same time maintaining a very distinct Shibuya/Harajuku vibe. It is also home to a store (modeled after a Japanese konbini, but stocked with Trunk brand goods and products from local vendors), a restaurant, a kushi-yaki stand, a chapel, four banquet halls, an exhibition space and a lounge, which is open to the public. Besides its four terraced floors, spilling with greenery, something else differentiates TRUNK from other hotels in this area. They call this concept “socializing,” and it might not mean what you think it means. The creators behind TRUNK are interested in ways that people can realistically contribute to meaningful social change. They realize that while this attitude is becoming more and more prevalent, it’s often difficult for such people to actually take action on it, and they wanted to put their money where their mouths are. 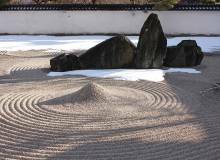 They also wanted to exemplify that doing social good does not have to mean giving to a charity or volunteering for a non-profit, and so they set out to change the perception in Japan of social contribution and open up easier and unexpected ways for individuals to participate. They’re achieving the above by focusing on five key elements — environment, “local first,” diversity, health and culture. These values are reflected in every detail throughout the hotel, and in every decision its creators have made. The focus on environment is reflected through the hotel’s abundant use of recycled goods. The bicycles available for rent are built using recycled pieces of discarded bikes. The hangers in guest room closets are built from repurposed steel. They’ve even opted to replace the ubiquitous slippers found in nearly every hotel in Japan with recycled rubber flip-flops that guests are free to take home with them. “Local first” means that TRUNK prioritizes locally-made goods and services. In some cases, this is very local — a number of the products found throughout the hotel come from businesses located in Shibuya and Harajuku. The TRUNK-brand beer, for example, comes from a local craft brewery. 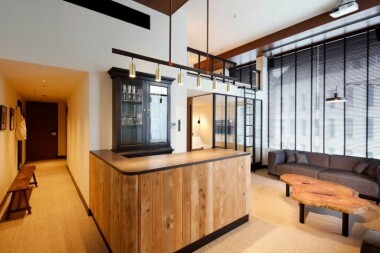 Elsewhere throughout the hotel, furniture and fixtures were designed and built by Japanese artisans, while woods and other materials are sourced from around Japan. 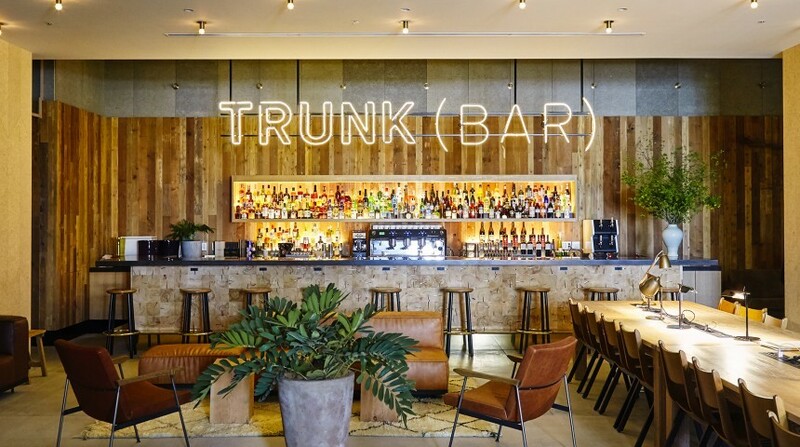 The TRUNK(LOUNGE) — you can’t miss it, just look for the giant neon sign that reads TRUNK (BAR) — figures to be the center for the hotel’s focus on diversity. The open, contemporary space is meant to bring people from various countries and cultures together in one place and encourage socializing and interaction. In addition to the aforementioned bicycles, the TRUNK(KITCHEN) helps promote health with its organic and locally-sourced menu. The TRUNK(STORE) also carries products focused on health and eco-friendliness. 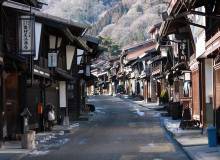 Finally, by culture, TRUNK means to promote Tokyo’s culture to the world, especially that of its local neighborhood. As mentioned, many of its goods and products are sourced from shops as close by as Shibuya. Additionally, the work of various artists will be hosted in its guestrooms and lounge space. 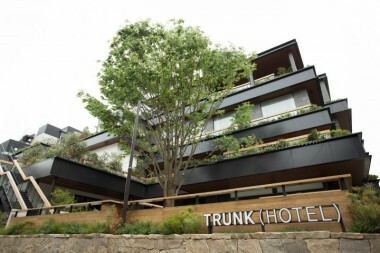 For more information on TRUNK (HOTEL), visit trunk-hotel.com.